Available in some amazing flavor options like Sea Salt, Teriyaki, Sesame and Wasabi, I too am now hooked on these tasty little snacks. I’ve tried them all, and the Sesame and Teriyaki are my favorites! They definitely have a “sea-like” taste, which admittedly tasted a bit odd at first, but after a few bites, I was down with the flavor. I love seaweed! And not only is it super low in Weight Watchers Points, it’s incredibly good for you too. My 3 year old loves them, but my 5 year old wasn’t a fan :(. But kids and adults in Asian cultures have been eating seaweed for a long time, enjoying it’s taste, texture, and many health benefits. 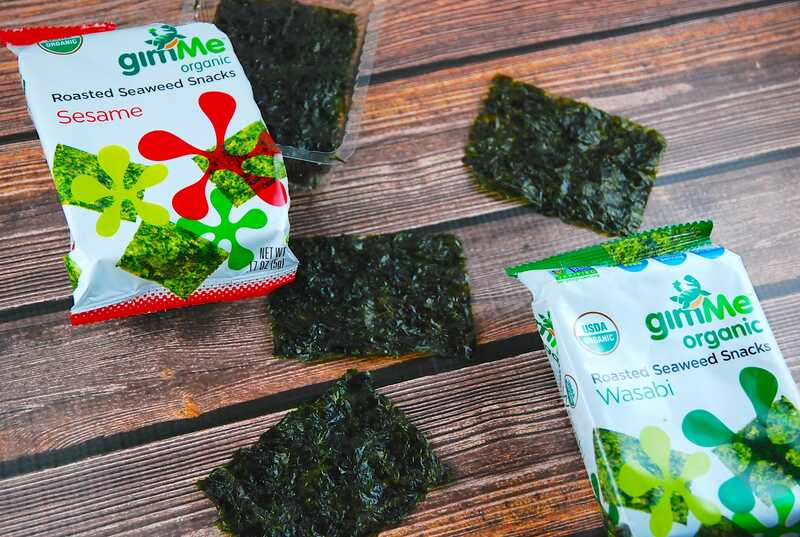 gimMe Roasted Seaweed Snacks come in 2 different sized packages, and both are 1 Point for the entire package, so hey, why not opt for the bigger one? :) They also sell a “crumbles” version, but I haven’t tried those yet. I get mine at Whole Foods, but you can also order directly from their website or on Amazon . A family friend brought a small tray over to try out. Taste just like the sushi bar but without the rice and salmon added. Was looking up on how many points per slice. Yet I found the nutrients good for those of us who had cancer treatments or are going thru the cancer treatments. I wish WW would check out how many points this little goodies are. Thanks.